It’s time for a new mattress unboxing. Meet the Yogabed! Yogabed is the newest player in the ever growing online mattress industry. With a litany of existing competitors from Leesa, Casper, Tuft & Needle, and more, Yogabed has an uphill battle to prove itself to become part of the family. My Yogabed came in the mail a few days ago, so I’m only a few nights into my sleep test. However, I did want to show everyone our Yogabed unboxing experience. A couple of weeks ago I had a chance to talk with Yogabed founder, Chris Marsh. In addition to providing me with all of the details about the Yogabed he also was gracious enough to setup a $50 discount promo code for Sleepopolis readers. Simply enter “SMR50” at checkout to get a $50 discount on any Yogabed mattress. As I said above, I am only a few days into my Yogabed test, so it’s far too early to pass judgement. However, the first few nights were pretty good. The Yogabed is one of the more unique mattresses I’ve slept on, opting to utilize a custom foam of their own creation, Yoga Instant Response Foam, as opposed to latex or memory foam. The Yogabed also includes two Yogabed pillows, also made from the Yoga Instant Response foam material. I’m definitely liking the pillows more than I thought I would. Most foam block style pillows end up being too firm for my taste. The Yogabed pillows are quite a bit more cuddly and moldable, especially compared to most foam pillows. A $50 Coupon Code – you can use it buy other stuff on Yogabed.com, in addition to their mattress they have sheets, a mattress protector, pillows, and an extra cover. Alternatively, you could share it with friends or family so they can save $50 on a new mattress. It does expire 45 days from purchase, so you don’t have much time to wait. 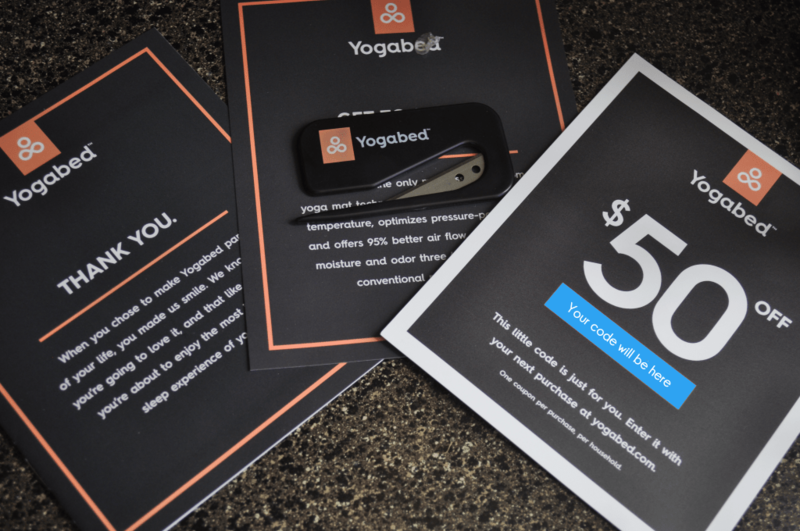 One final reminder, if you do decide to give Yogabed a try make sure you use our $50 discount promo code. You’ll save $50 instantly. Just enter “SMR50” at checkout. I hope you guys enjoyed our unboxing video. We’ll have more to come on the Yogabed soon, including our full contextual and video review within the next week. Let me know via the comments below if there are any specific features or questions you have and I’ll make sure they are addressed in our upcoming reviews. The models I’ve looked at are Leesa, Casper and Yogabed…would any of these be good choices? The Casper Wave looks promising, but it’s expensive and I would hate it if I ran into the same hardness problem. Yogabed? Based on your requirements I would definitely recommend staying away from Casper & Yogabed. Casper uses latex, and while Yogabed doesn’t it is the most bouncy mattress I’ve tested. Leesa might be one option you could consider. They use Avena foam instead of Latex, and while Avena is similar in feel to Latex it sits on top of 2.0 inches of memory foam. This helps give it a little more of a balanced feel as opposed to extra bouncy. If you’re really look to stay with a feel similar to your Tempur-pedic you might think about Saatva’s brand new Loom & Leaf mattress. It officially launched just last week and it’s designed to be comparable and better than Tempur-pedic. It uses high-density memory foam and an extremely high quality cooling gel layer. I haven’t sleep tested the Loom & Leaf yet, but I will be getting one to review within the next week or so. So stay tuned for that. I have an older Tempurpedic bed and purchased it about 11 years ago so it’s about that time to replace. I am on day 20 with the T&N and can’t sleep at all on it, it’s way to firm and I feel like I slip around on it rather than move around on it. Wondering which mattress you would recommend that has more of the memory foam feel rather than the latex bounce? Hi Sleepopolis, thanks so much for providing this great resource! My partner and I are buying our first mattress in many years and have found ourselves drawn to the brave new world of Casper et al. From your reviews it seems like the Yogabed might tick all the right boxes for us – a bit firmer than the Casper, and the washable cover seems like it’d be a nice perk if we decide to adopt a pet down the road. Our biggest concern is related to the proprietary materials used in its construction. Do you feel like they would be durable over time, particularly the gel used in the middle? All of these mattress companies are of course pretty young, and while I don’t doubt that the Yogabed is a quality product it would be a shame to make the investment only to have something go south a couple of years down the line! Any insight you could offer would be greatly appreciated. At this stage, it’s quite simply too early to tell the long-term durability of the foams used in Yogabed. Since they are 100% custom creations there is no way of definitively knowing. Yogabed does come with a 10 year warranty (the same as pretty much all of the online mattress companies), so that helps a bit. The foam and gel layer they used are quite different than most others I’ve tested or reviewed. I’m sorry I cannot be of my help on this question. If you’re worried about durability of the foams I would highly suggest you take a look at Leesa if you haven’t already. Leesa has a similar feel to Yogabed and uses foams that have been tested and vetted for years. Please let me know if there are any other questions I can answer! Hi, I was wondering if you were planning to do a side-by-side comparison of the Yogabed with any of the others (Leesa, Casper, etc). I was ready to pull the trigger on the Leesa until I heard about this one, the extras are speaking to me but I don’t want them in exchange for a lesser quality mattress than my original choice either. Thanks for all that you do! The Yogabed comparison review series is on my radar and you’ll begin to see those posts next week (unfortunately I am out of town this weekend and won’t be able to write much). If you have any specific questions on these I’d be happy to answer them here or drop me a note via my contact form. Thanks! I talked with the Yogabed founder, Chris Marsh, about this exact topic a few weeks ago. At 2.5 inches it’s less than Casper, Leesa, and Tuft & Needle. However, their top layer is quite expensive and an extremely high-quality foam. Chris said that because of how responsive and supportive this foam is, it didn’t make since to have to be any thicker. After sleeping on the Yogabed for about a week now I really don’t feel like only having 2.5 inches is hurting it. It still has nice comfort and good support. Did they tell you more information about their specialty foam? Only 2.5in of specialty foam on a 10in bed seems considerably less than the competition. I would say it is very similar to the Leesa in terms of firmness. Right about a 6 out of 10 on the firmness scale. Casper is a bit softer than both the Leesa & Yogabed. Granted its been a few days since you uploaded the video, how soft/hard is it compared to the Leesa or Casper?